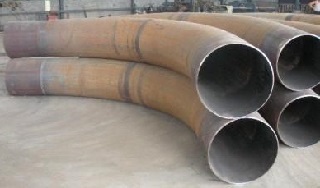 ASME B16.49 is the standard specification covering the design, material, manufacturing, testing, marking, and inspection requirements for factory-made pipeline bends of carbon steel materials that have controlled chemistry and mechanical properties, produced by the induction bending process, with or without tangents. This Standard covers induction bends for transportation and distribution piping applications such as ASME B31.4 and ASME B31.8. Process and power piping have differing requirements and materials that may not be appropriate for the restrictions and examinations described herein and, therefore, are not included in this standard. Mid-frequency induction-bending machine for the manufacture of induction bends. 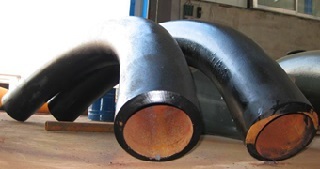 Induction bends manufactured to ASME B16.49 can be either made from seamless or welded pipes with or without tangent length by cold- or heat-forming process. Generally, heat-forming process is applied which utilizes the mid-frequency induction-bending machine. 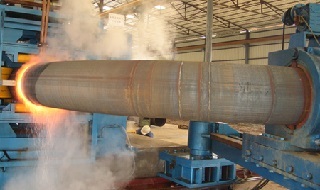 This process utilizes induction heating to heat a narrow band 360 deg around a pipe or cylinder at the point of bending as the pipe or cylinder is being pushed through the inductor coil at a constant velocity. After the material passes through the coil, it may be cooled by forced air or water spray, or it may be allowed to cool in still air. 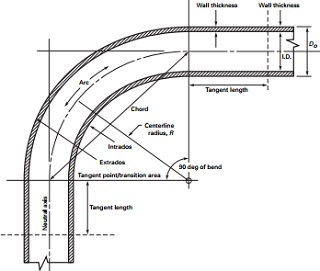 Bends in any producible wall thickness and diameter are covered. ASME B16.49 induction bends without tangent, 5D 12″ SCH80. *1. The chemical requirements of this table are intended to record the maximum permissible amounts of individual elements. *2. The Carbon Equivalent C.E.=C+Mn/6+(Cr+Mo+V)/5+(Cu+Ni)/15 shall not exceed 0.45%. 5D bends with tangent lengths, 90° STD 12″, A234 WPB, ASME B16.49. Stress Relieve or Temper. Uniformly, heat between 480°C (900°F) and 675°C (1,250°F) and hold at temperature for at least 30 min per 25 mm (1 in.) of thickness at temperature, but no less than 30 min. Normalizing. Heat above the transformation temperature range and hold at temperature for a minimum of 20 min per 25 mm (1 in.) of thickness, but not less than 20 min, and allow to cool in still air. Quench and Temper. Heat above the transformation temperature range and hold at temperature for a minimum of 20 min per 25 mm (1 in. )of thickness and direct quench in either water, oil, or a synthetic quenchant. Reheat to temper as defined above. Quench facilities shall be of sufficient size and shall be equipped to ensure proper and uniform cooling. According to ASME B16.49, the necessary test & inspection include: dimensional inspection, visual examination, tensile testing, charpy v-notch test, welding test, hardness test, ultrasonic test, radiographic test. Drawing of ASME B16.49 induction bend, 90° 3D with tangent lengths. Induction bends may be furnished with an angle of 90°, 60°, 45°, or 30°, etc. The welding ends shall be prepared in accordance with ASME B16.25. A commonly seen designation 3D, 5D, 6D, 7D, 8D, 9D, etc, denotes the length of its centerline radius. For example, 6″ 5D, the centerline R = 5 x 6″ = 30″ = 762.0 mm. To order an induction bend manufactured to ASME B16.49, some more details are required: seamless or welded, material, with or without tangent, quantity, heat treatment, e.g. 90° Hot-Induction Bend, ASTM A234 WPB, SMLS R=5D 8″ SCH40, with a tangent length=150 mm at each end, bevel end, QT.